Despite the laundry room's snazzy gallery wall, the powder room's funky wallpaper, and the living room's huge set of unstyled built-ins, I still feel like most of my walls are a desolate wasteland crying for help art. I guess that's as good a sign as any that I'm no minimalist. There are a few reasons my walls are still bare – primarily a lack of art and a lack of frames. Go figure! Owning a house has suddenly made me very picky about what I put on the walls, and the filler from old apartments won't do anymore. I'm not trying to start a highbrow art gallery here, I just want a well-appointed collection of pieces that make me smile when I pass by. Is that so much to ask??! As it turns out, it’s really hard to find good artwork that doesn’t cost gobs and gobs of money. Hence the filler and the empty walls. And more surprisingly, it's hard to find matted frames in stores that fit what I want to hang. Hence the lucrative industry devoted to custom framing. This is all to say that I've set off on an art-gathering, frame-making mission – and I'm starting simple with this majestic Rifle Paper Co. calendar cover and a (seriously) effortless frame. (Can we call it a frame? Cuz I am.) But before we get to that, I just gotta say I am in love with all things Rifle Paper Co. right now! The colors & illustrations are so charming and girly. "Girly" isn't my usual aesthetic & a calendar cover isn't my usual idea of "art," but I love this one & it makes me smile, so up on the wall it goes! 1/4" x 3/4" flat screen moulding – the length should be 4 times the width of your image + breathing room. For me, that was about 4 feet. Suede cord – you can find this at any craft or jewelry store. I recommend flat cord rather than round because it's easier to tie. The length should be about 5 or 6 times the height of your image (better to err on the longer side). For me that was about 9 feet. A saw – I used an $8 miter box saw from Home Depot. This thing is a life saver. I carefully tore this cover off my calendar and started by laying the wood across the top. I eyeballed the width, leaving about an inch of wood overhang on each side to give me space for my leather ties. I didn’t need that much space, but I like having the flexibility to swap in larger artwork down the line. If you prefer a more precise fit, a half inch would likely work. 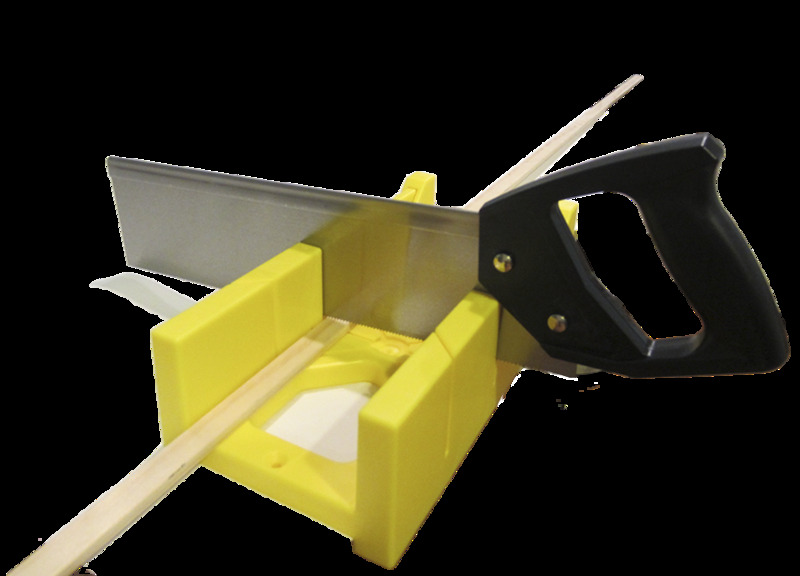 I used a miter box saw to make my cuts – to clarify, that's the yellow contraption with the slits in it & the back saw. We have 3 power saws in the house, but this school-bus-lookin'-get-up is ideal for accurately cutting trim & moulding. The bottom of the box has a lip that hugs the edge of the table, making it easy to keep it straight. Then you just slide in the wood, brace it against the side of the box and saw away. It takes a little more elbow grease than a power saw, but you reap what you sow. A precise, square edge! I used the wood from my first cut to measure three more – giving me 4 total. This is totally optional, but I prefer a warm brown tone over the raw pine. I used leftover deck stain, which isn't ideal for this type of project because it's got a different consistency for weatherproofing. Ideally I would have had a small test pot of interior wood stain on hand, but #rockwhatyagot! I laid my wood out on a paper grocery bag, brushed on the stain, let it sit for a few minutes, and then wiped it off with a paper towel. I did this a couple times, letting it dry for a few minutes in between coats, to layer on more color until I got the richness I wanted. I only stained the fronts & sides of the wood – not the back – and I let it dry overnight so as not to accidentally stain my picture. Once the wood dried, I laid a piece face down and lined the top of my picture to be just below the top edge of the wood and horizontally centered. Once it was positioned, I used a couple small pieces of scotch tape to keep it in place. This saved me the headache of having it shift around while attaching the other pieces. Then I lined up a second piece of wood on top to make a picture sandwich and broke out the suede cord to tie it all together. My plan was to cut the cord after each knot, but plans are boring – I like to shake it up! While I was laying everything out I realized I liked the look of leather running down the sides to visually complete the “frame.” It makes it look more meaty & modern, less like an ancient scroll that may disintegrate at any moment. I placed the bottom two pieces of wood just like I did with the top – taping the picture to the base and then lining up the front piece. I ran the cord down the length of the picture, wrapped it around the bottom pieces of wood a couple times and tied a knot. Then I ran the cord back up, wrapped it once again and tied another knot. I didn't do any fancy sort of knots – just whatever got the job done. Remember, effortless is the name of the game here. The only tricky bit in this entire project was making sure these side cords weren’t tied too short (making the paper billow) or too long (lookin' like a dangled mess). I found the easiest way to test the length was to gently pull the top and bottom pieces of wood in opposite directions, fully extending the picture. *clears throat* I mean, I ran it through my gravity simulator and computed the results to 1/1000000000th of a micron thus fully accounting for the Earth's rotational effects on the last Monday of the 11th month of 2014 and the fibers and #science.... right. So we're clear now... moving on! My suede cord came in 2-yard increments, which was enough to tie the tops and one side. I started with a fresh piece of rope for the other side, knotting it at the top, repeating the process of running it down the side, tying it at the bottom, and running it back up. Above is a close up of the knot on that second side. Super precise, right? And ba-da-bing-ba-da-boom! Finito! I love when things that look effortless actually are effortless. Unlike my messy-but-not-too-messy "bedhead" today. I did this entire project one night after work (+ some drying time for the stain), and now my "items to hang" pile is one piece shorter. Phew!